Former St Helens utility player Josh Jones has left Premiership side Exeter Chiefs to return to rugby league. Jones switched to union at the end of the Super League season but has not made a first-team outing for Exeter. The 22-year-old will now head back north with his partner, who is expecting their first child. "I cannot speak highly enough of everyone at the Chiefs because it's a special club with a great culture," Jones told the club website. "Rob [Baxter] gave me a great opportunity and a new challenge, but due to family circumstances I have to cut it short early." 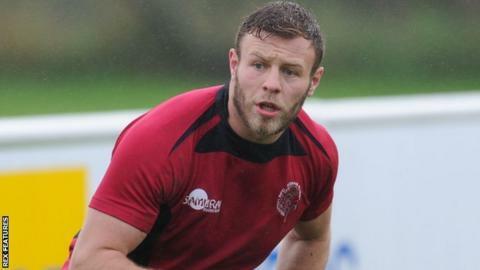 Jones appeared as a centre for Exeter's reserve side and also on loan at Taunton Titans, who play in the fourth tier of English rugby union. Before joining the Chiefs, he was a member of the St Helens team that won the Grand Final in 2014. He follows in the footsteps of fellow cross-code covert Sam Burgess, who decided to return to rugby league in November after representing England in the Rugby Union World Cup. "We're sad to see him move on, we wish him every success for the future and in finding a new contract back in the Super League," said Chiefs head coach Rob Baxter.